This is another version of the cake I fell in love with on www.pinkcakebox.com. 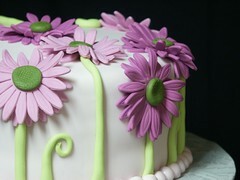 You can click here to see the first one I did, which was also my first fondant cake and featured peachy-pink flowers. This is my fourth try at covering a cake in fondant, but I'm still not sold on it. I guess I just need more practice before I can be comfortable with the whole process. The cake is three, 1-inch layers of German chocolate cake. I made a traditional cooked filling with coconut and pecans. The outside of the cake was frosted with chocolate frosting I made from Ghirardelli sweetened chocolate powder, then it was covered in vanilla fondant. The "pearls" around the border and the green stems are both made of hand-rolled fondant. The flowers are gum paste. The fondant for the stems was colored with Americolor Electric Green. I used a little bit of Americolor Fuchsia to color the fondant that covers the cake. I added a little more color for the lighter flowers and then added a bit more for the darker flowers. Feel free to contact me if you have any questions about the techniques I used to make this cake. Hi, Kim! I'm throwing a bridal shower for my sister who loves gerber daisies & when I googled for examples of cakes with gerber daisies, your blog came up. It's really beautiful! I'm fairly new at using fondant myself & I did have one question. If I buy the daisy cutters will they leave that imprint on each petal or is that something you had to do for each petal yourself? I hope my question makes sense. The shower is this Sunday & I'm getting nervous about getting everything done in time! If you've never used these cutters, let me know. I have some tips for you that were given to me and made it much easier than if I had tried on my own. Good luck! That is really beautiful! I love it! I have never used that cutter before so I welcome any tips you have! I plan to frost the cake on Friday & do the fondant on Saturday. Is this the Wilton daisy cutter? That's the one I bought today, but will get a different one if that's not the one you used. I used the PME daisy cutter. My Wilton instructor showed me how she uses it. You roll your gumpaste really thin and then lay it over the cutter, holding the cutter upside down in your hand. Using your other hand, rub your small Wilton fondant rolling pin back and forth over the die until you've got a clean cut all around. Remove the waste.Turn the cutter over onto your work surface and press down on the plunger. It takes a while to get the hang of it and sometimes you have to gently pull it from the cutter. I found that pouncing the cutter on top of a cornstarch puff before each use helps out. I stacked two flowers and rotated the top one slightly so that the petals were offset. Then I rolled little bits of tissue and tucked them underneath the top petals to prop them up. You might want to dust the tissue with a bit of cornstarch so it doesn't stick to your fondant.